MOUNTAIN VIEW, Calif.–(BUSINESS WIRE)–Feb 12, 2019–Upwork (NASDAQ: UPWK), the largest freelancing website, today released its newest quarterly index of the hottest skills in the U.S. freelance job market. 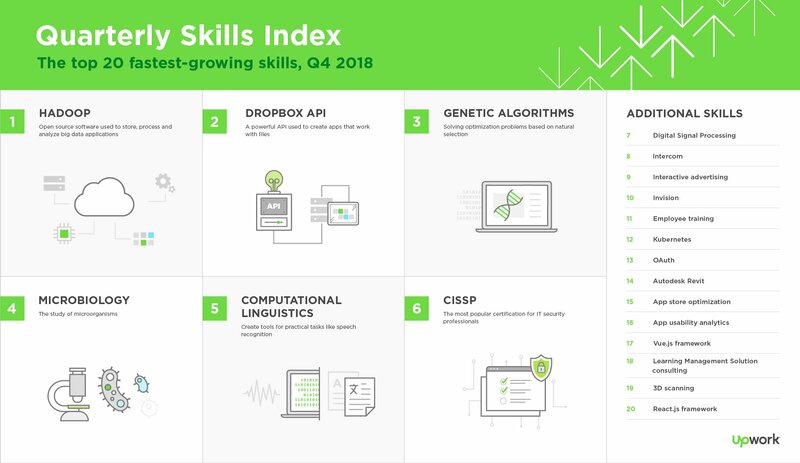 The Upwork Skills Index ranks the site’s 20 fastest-growing skills in a quarterly series. It sheds light on new and emerging skills and provides real-time validation of current trends in the labor market and tech industry. According to a new report, staffing firms believe talent scarcity is the biggest inhibitor to their business today and will still be the biggest inhibitor 10 years from now.